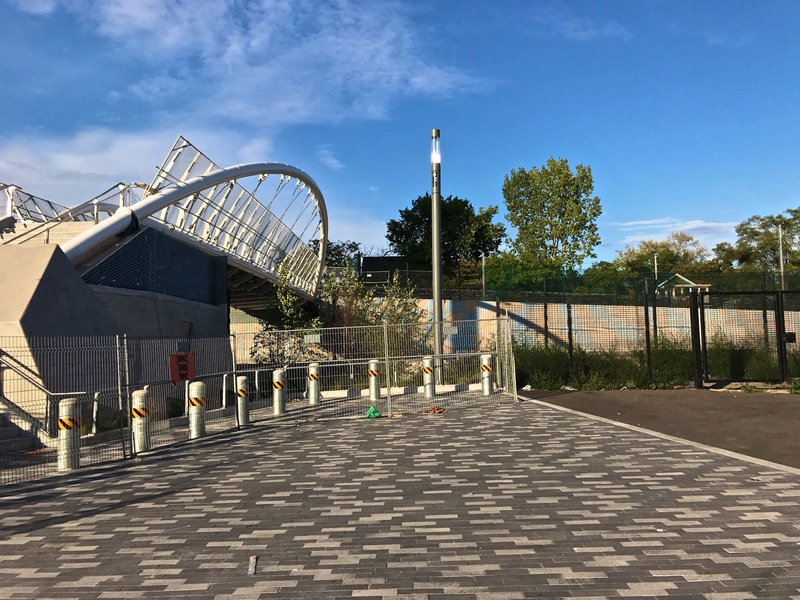 The John Street pedestrian bridge, still off-limits; as seen from the Weston Road side. The John Street bridge, despite Frances Nunziata’s assurance, remains closed. She said in her email circular that the safety barriers would be installed by the end of this month. The bridge was supposed to be opened in 2014, then 2015, then in June. Then August. Or September. Maybe it’s the contracts (Albanese). Maybe it’s the railing (Nunziata). One thing is certain: the most convenient route from the village to the market and Weston Road remains inaccessible. How do we get on to Nunziata’s “email circular”? The bridge is ugly. The City is fighting to keep the bridge closed because its ugly and they dont want to spend money on keeping it clean, since everyone knows it simply ugly. My gosh, its just an ugly bridge. From what i heard from somebody working on the project, The main reason the bridge still hasn’t opened is because the City of Toronto and Metrolinx are in dispute as to who will be responsible for maintaining the structure once it is opened. The excuses given about railings, etc. are just a bunch of smoke and mirrors. All the work they claim is holding up the project could have been realistically finished within a week. This is all about long term maintenance & liability which costs money over time. Why volunteer for this responsibility when you can try to pawn it off on some other entity? Your inconvenience is the least of their worries. Money trumps all! forgot to add, it would make perfect sense to make the work drag on while this dispute is taking place. How embarrassing it would be if the bridge was completed on time but it had to remain closed because of the maintenance dispute. The mood would change from a feeling of inconvenience to anger, rather quickly. My guess is that the company doing the work is “taking one for the team”, so to speak. Once again they are feeding us a bunch of baloney on the John Street pedestrian bridge. By my count the bloody thing has been completely finished (all railings in place and properly installed, etc) for over two weeks now. No workers are on site any more but the bridge itself remains closed to the public by way of a chain link fence at both ends of John Street. Would you agree its an ugly bridge? I spoke today with someone involved with the bridge on my way to the train station. He told me it is finished and the delay is squabbling between the City and Metrolinx. For my money, that amounts to squabbling between Frances Nunziata and Laura Albanese. They should sort this out. You’d hope that a Minister of the Crown and the City’s Speaker would have some influence. Problem is Weston has poor representation within the community and at the government level. Where is the resident association and BIA? Oh BIA doesnt care because folks on the east side of the track dont shop along Weston Rd…the Resident Group believes they did a marvelous job getting suckered into a 30 storey tower and feel their job is done and Nunziata and Laura are BFF so they would never challenge each other and I don’t even know the federal guys name….and I honestly dont think most people care that the bridge is closed…its ugly. You fools keep voting in Nunziata and Albanese. Don’t complain now. Previous Previous post: Let’s re-think cars on our streets. Next Next post: Hurricane Hazel Talk next week.